I love to have color in my wardrobe and in my home so, when the weather transitioning from winter to spring, I like to put away all the dark-colored items and bring out bright and colorful pieces. First, I put away winter decorations like my snowman collection and winter wreaths and get out my box of spring decorations. This includes a lot of flowers, bunnies, birds, and egg decorations that can also be used as Easter decorations. In the featured image above, you can see that I’ve added a lot of the color yellow around my home this year. It’s a light and airy color that just makes you feel happy. 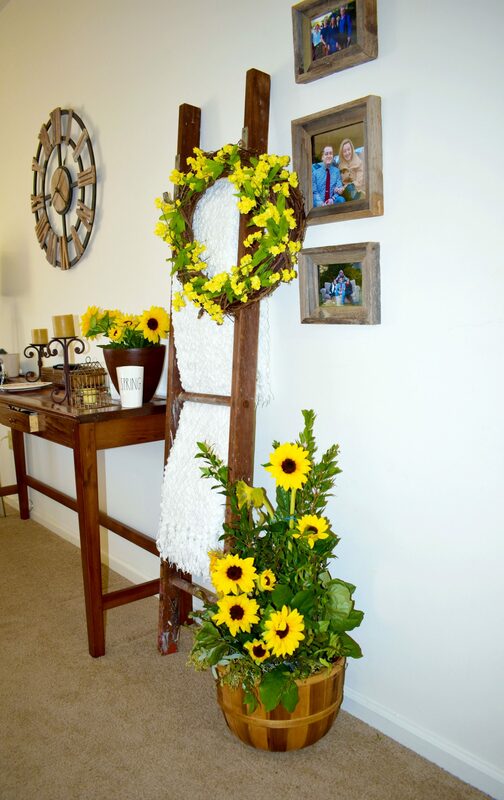 I’ve decided to make a simple fake flower wreath with pieces bought from Hobby Lobby and hang it on my wooden ladder. I also have yellow show towels and fresh sunflowers on and next to the ladder. Now I really struggle to keep real flowers and plants alive because of my lack of a green thumb. So, if you are like me, don’t feel bad about buying fake flowers to put in a vase at home. I always look for the ones that don’t look too plastic so that people will think that they’re real at first glance! But if you do have a green thumb and can keep plants alive for more than a week then you can certainly grow your own or buy some real flowers to decorate with. In the image below I bought two bouquets of flowers and then cut them apart to make my own assortment. You don’t need a lot of greenery in your home to brighten up your space but just a small floral arrangement on the coffee table or by the windowsill. Put away the really heavy blankets and pillows that you have on your bed, couch, and chairs. Replace them with light fabrics, fun spring patterns, and bright colors. During winter it makes sense to have a collection of thick wool, knit, and faux fur blankets, but in spring we don’t need them anymore. Switch out those blankets for thin cotton throw blankets and put some cute spring throw pillows on the couch. A very simple and easy way to instantly make your home ready for spring is to change out the curtains and rugs. It really makes a big difference in the look and feels of a room to change out dark, cold weather blocking curtains, for light and airy curtains that let the sunlight in! This can be a very simple change out that doesn’t have to cost a lot. You can buy nice curtains for a decent price at Target or on Amazon. Big area rugs can be quite expensive so try switching out smaller rugs that are in the kitchen or bathrooms. You can also switch out our welcome mat outside your front door to let people know that you are ready for spring! Little things that you can do to bring some spring into your apartment is add in small little accessories and decorations. On top of switching out the blankets and throw pillows that you have around your home, you can also switch out smaller items. Change your red and green candles for orange, pink and yellow ones. Change out dark photo frames for white or light brown frames, and you can even switch out the photos in the frames to change things up. Move around the books on your bookcase and put trinkets in different places around your home. 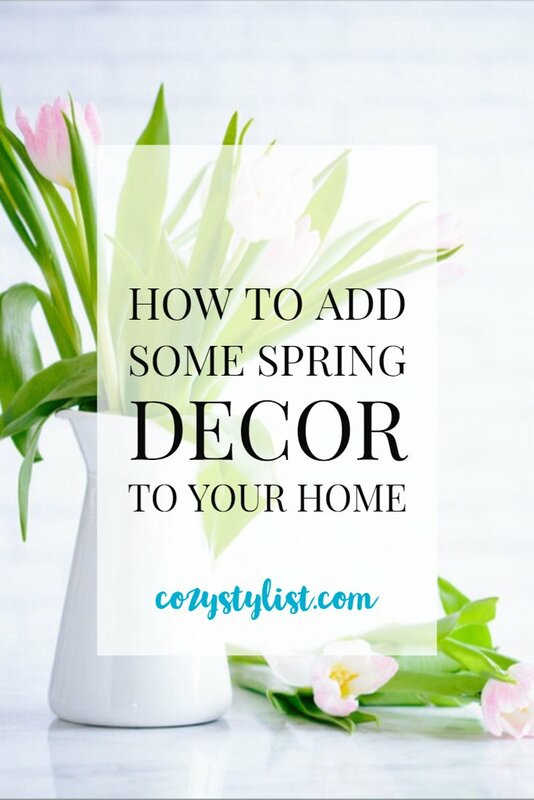 You don’t have to go out and buy all new decorations to bring spring into your home, you just have to make some changes to freshen up your space. Yessss spring is so near! Decorations really make a difference to lighten up our living space and flowers is a great choice! I want to bring flowers in my living room and my room but I’m just so bad with them.. Thanks for sharing! Your decorations are so cute! I love all the flowers! I love fresh flowers, but those silk flowers in your vase look real! Silk orchids also add a touch of beauty, because even though I grow orchids, they are not always in bloom. Thank your for these great tips. The fake flowers are from Hobby Lobby! Most craft stores have a selection of fake flowers that look so real! Great advice. I love how it only takes a few small changes to really bring that spring feeling into the home. I’ve never been much on decorating for the season, but now I want to give it a try. 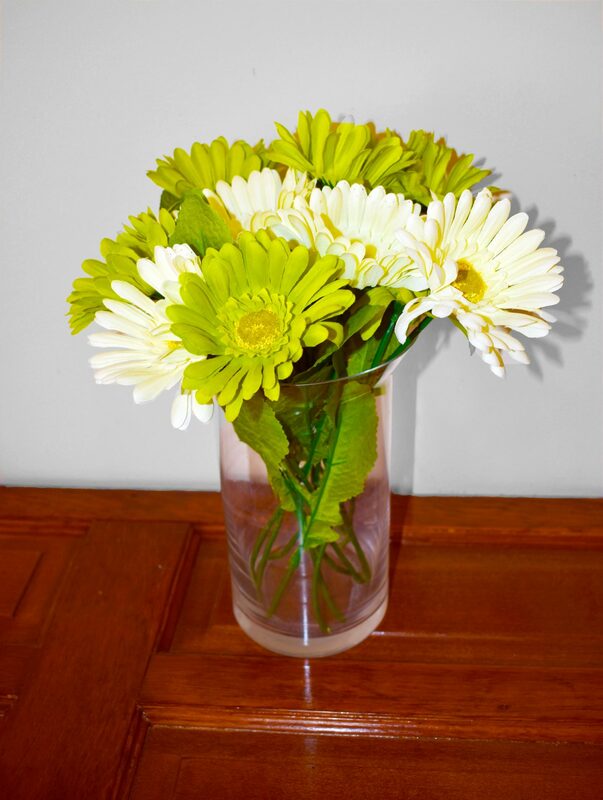 Try to add some flowers on the kitchen table to bring some spring into the room. You don’t have to go all out with décor. I love the fake flower idea, because I too have something of a black thumb rather than green! Such a great compromise. Thanks for sharing these great tips! SAME! I kill every plant I touch lol I recommend Ikea fake plants. They are cheap and look real! I’m obsessed with yellow at the moment, such a bright colour and have been adding it into my room! Yellow is great for Spring! These are some great ideas! I love changing up the house to suit the seasons! I think adding flowers or plants in a home is a good idea! It makes the home have a refreshing and relax feel! I’m all about the brighter colors and fresh flowers right now! Springtime is just the best! What a gorgeous little post. I love the yellow flowers, gives such a fresh spring vibe! This post is definitely inspiring me to think about decorating for spring. I typically don’t decorate for spring, but some brighter & lighter decor sounds lovely. I loved reading this post 🙂 it made me think of all the things I LOVE about spring and summer. I love going clothes shopping for bright and pastel outfits, especially dresses. As well as buying colourful flowers from the local supermarket. I love how all the little touches can make a big difference! I definitely like how changing a few things throughout the house can also just make things feel so much more refreshed! Love the flowers! Spring is definitely in the air! Fresh flowers are a go to for me!